🕵️ Authors: Do You Really Need a Grammar Check? Even if your own grammar isn’t one hundred percent perfect, you have to admit that when you catch a grammatical foible in a book you’ve paid for, your writer senses tingle and that sudden slump of disappointment kicks in. You start to wonder whether the author, editor, or publishing house even bothered with a rudimentary grammar check. Everyone needs a helping hand now and then. That’s just a fact of life. Substance does take precedence over style (funny, coming from us!) but when submitting your work to be published, the fewer mistakes the better – especially when it comes to your use of language. Grammar rules are largely unbreakable, and programmable. That’s why they can be automated. Based on the context of complete sentences, online grammar checkers use a database of known grammatical errors to correct mistakes in any text you enter. Do you also need grammar checking software to help you as you go? In the early years, any given online grammar check could only handle rudimentary functions such as incorrect capitalization – but as the technology has progressed, these programs have learned to understand context, and can identify misused words with unmatched accuracy. Unlike humans, computers don’t skim read or unconsciously miss things. We’ve talked about readability formulas before, and these are also excellent when you need your writing to be understood by a general or varied audience or to meet industry benchmarks such as writing insurance, medical or financial documents. On the other hand, the problem with readability scores and grammar checkers is that they only tell you if your writing is structurally sound. They can’t tell you anything about the logic you employ, if your arguments are forceful or weak or if your metaphors are fresh or stale. Put simply, online grammar checkers and readability formulas are blunt instruments like a whisk and a wooden spoon – useful for speeding up the process, but ultimately not essential for the recipe. Thankfully, though, since these rules are now so easily programmable, you can easily treat yourself to a free grammar check in minutes through a quick Google search. But let’s go back to the main question: do you really need it? Well… that’s up to you. 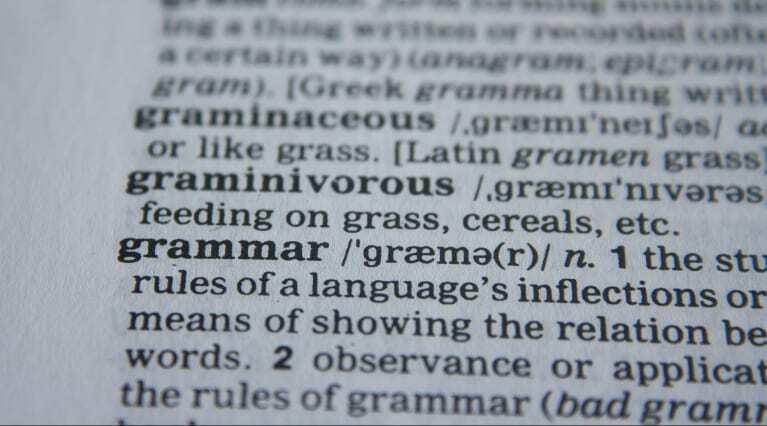 You may truly feel you don’t need one, or you may be open to (or conscious of) the notion that your grammar could do with the occasional cleanup. As long as comprehension doesn’t regularly suffer in your writing, you’ll tend to get along just fine – but it can’t hurt to fire it through a free grammar checker before moving onto the first real meaty part of the post-writing work: the line edit. Your draft (either complete manuscript or separate passages/chapters) is written. The draft is then fed through a grammar checking program to ensure adherence to rules. Your grammar-checked draft is put into AutoCrit for style corrections – minimizing non-grammatical issues such as repetition, clichés, poor pacing, over-description and adverb overload. Should you wish, it’s at this stage you can compare your work to successful novels in your genre – giving you the best possible context-driven guidance for your personal line edit. Your freshly self-edited writing is passed to your human editor, who gets to work straight away on story development – pointing out flaws in character arcs, story beats, logical inconsistencies, and all those finer details that get the story itself to a publishable standard. To get the most out of your writing process, you need to take care of the fundamentals before you attack the narrative root of your manuscript. As wonderful as AutoCrit is, it can’t tell you that your plot is eerily similar to something that was published last year, or that the scene in the coffee shop needs to be relocated to the train station. Only a living, breathing editor can do that for you… and they should be able to get to it as quickly as possible, not forced into spending their time fixing your adverbs. As a fiction writer, when you look at the four-step process you see above, which part appears most superfluous? If you said the second part, it would be hard to fault you for it. So that’s our opinion. Running your prose through a free online grammar checker can be a very useful step if you do find basic grammar to be a regular stumbling block – but your work shouldn’t stop there. Checking grammar alone is definitely no substitute for a high-calibre line editing tool for your self-edit run, and won’t offer your story the profound benefits the mind of a human editor can provide. What do you think? Is our reasoning sound? Do you use a grammar checker every time as part of your process, or do you get along just fine without it? Are there any free grammar checkers you’d recommend? Let us know in the comments! I totally agree. For me, it represents yet another time consuming step that takes me away from the real work of revision. As a new writer, this would be very helpful. I would use it. Thanks for your feedback and good luck with your writing! Neither electronic nor human editors in any capacity will ever be the be-all or end-all miracle for any manuscript. In our current culture, we have been trained to seek the quickest, easiest solution (the one magic method that will do it all for us) without having to discipline ourselves to do the hard work required to polish a piece to be the best it can be. That being said, we should use any and all tools available to us, both electronic and human, to help us get our manuscripts to that as-perfect-as-possible level. One caveat: we should recognize (and you folks probably already do) that one grammar checker program will have certain strengths and certain weaknesses. Another software program may counteract the weaknesses in any given program. I specifically DO NOT RELY on MS Word’s spell- and grammar-check (which I recognize as not deliberately designed for professional editing work), for I find it to be badly flawed. In working through the manuscript for my 2013 novel “Bead of Sand,” I found many instances where the grammar-check program instructed me to make a grammatically correct sentence incorrect. I contacted Microsoft about the issue, and their answered that they are not responsible for software developed by other companies. This was about their own MS Word program! Obviously they are not interested in standing behind their own software. If they aren’t interested in providing quality options in their own software, they shouldn’t include it at all. Thanks for giving us some insight into your process! As a nonfiction writer and editor, I’ve found it very helpful to use free trials (with grammar checkers). I use them at random times to keep me on my toes or to save some time if I’m facing a deadline and my eyes are tired. End-of-deadline crossed eyes are real, aren’t they? That’s a great time to get some objective feedback from an online-based tool! For me checking grammar is critical. So my normal practice is to check grammar first on Grammarly.com, and then to work through the edits via Autocrit. I use Grammarly free edition in Word, which does catch the occasion misplaced comma, or misused word. However, it does sometimes flag things wrong, because it doesn’t understand the context correctly (either that or I am a complete idiot when it comes to sentence structure). It also chokes on dialog because of specific character voice. If AutoCrit did have a grammar checker, perhaps it should offer what others don’t: a checker for fiction! Especially one that gives a little leniency when it comes to dialog. See, I even screwed up my post. I use Grammerly, the paid for edition. It is invaluable and I am sure my critique group will agree. We’re glad to see that you’ve found online-based editing tools helpful in your writing journey. Since most of us have a grammar check in our word processing software, it seems redundant to include it in AutoCrit. And it could be annoying, because if Word or WordPerfect pointed out an “error” and we chose to keep the original (as in Eric’s example), you’d have to jump that hoop again in AutoCrit. I say skip it. Speaking as a writer, professional editor, and an English professor, I think a grammar checker is useful as a proofreading tool. However, it cannot do everything for you. Grammar checkers are completely confused by sentences that use noun phrases as there subjects. Add to that, the fact that manner writers use techniques like sentence fragmentation and ellipses to create mood and suspense in their stories and you have a grammar checker that will underline everything in your text. They are good for double-checking that you’ve used the correct verb tense or haven’t left words out and things like that, but as noted above, they’re no substitute for knowledge of the mechanics of language or a living, breathing editor. There’s definitely always going to be a place for real, human editing. We hope that programs like AutoCrit can help authors send the most polished product on to their editors. I’d love the ability to correct punctuation as well. If anyone has a suggestion, let us know! Hopefully some folks will chime in with some suggestions. I found running through AutoCrit first got my work polished enough to worry about the grammar. I think doing it the other way around would waste time as so much needs changing in my writing. We’re glad you’ve had a great experience with using AutoCrit to polish your work! I use Grammarly. Yes, I need a grammar help, but need one that leans more toward American rather than British spelling, use, etc. Thanks for the feedback! We appreciate it. I use grammarly then autocrit for all my writing. Grammarly misses things, perhaps because it is very limited in assessing fiction. Perhaps because of the many ways of using some forms of punctuation – especially commas. Also the word-use & dictionary is very basic. Since I pay for grammarly I would prefer a one-stop shop, but Grammarly is very useful across multiple software applications which might not be easy to replicate. We’ve designed AutoCrit to be focused on fiction, and we hope to continue making it a tool which is beneficial for fiction writers, so thank you for your feedback! I read a lot of new writers work and if anything stops me reading, it is bad grammar. I can handle ugly plotting, bad continuity, weak characters, but if I’m constantly stopping to mentally correct grammar, I give up. Yes, you need a grammar checker. The little things tend to stick out and jar the reader from what could be a very enjoyable storytelling experience–you’re absolutely correct. I’m fairly new a this but I believe the fewer errors in the document before it goes to a human, the better. Whether the human is an editor or reader, I don’t want the book to be tainted by a few grammar errors in the first page. Having said that, if I were forced to drop one item from the list it would be the grammar checker. But, only if forced. We agree and we hope that AutoCrit will be an asset to you as you polish your story before sending it off to your humans! My process for the last few years has been rough draft, a pass through Grammarly (premium), a pass through Autocrit, a second pass through Grammarly to clean up any changes made from the Autocrit stage, and then off to an editor. I find each stage refines my writing and allows me to almost see the manuscript in different ways. I find the grammar stages quite important, but I often need to ignore some of the grammar rules that pop up in order to favour style. I rely on Grammarly to unearth mistakes in grammar, but I am realistic enough to know it isn’t perfect. But at least it catches enough together with Auto Crit, before I send it to my Editor. I would support the notion of a Grammar checker in AutoCrit, but I would need to know more. I use Autocrit and then Grammarly Premium. Neither tool performs its respective function 100%, and as a fiction writer, I sometimes take liberties with structure and grammar, but both are helpful. I do think a robust grammar checker, along the lines of Grammarly Premium but for fiction, would be an excellent edition to Autocrit., Perhaps as an add-on that runs as a separate function. Context is critical. I believe grammar and editing are inseparable. Change one often affects the other. Moreover, the isolated use of grammar and editing checks are ineffective regardless of their rigor. Like attacking a disease, the author needs to play doctor and apply an array of therapies at the right time and in the correct combination. Sequencing, as well as redundancy, is important. For example, Microsoft Word -> Review -> Spelling & Grammar applied after Autocrit and Grammarly find straight-up grammatical errors as well as grammatical errors created by suggested edits. Also running Autocrit after Grammarly undoes many of the Grammarly detections, partly due to the author’s efforts to comply with Autocrit. (Sometimes a 70.35 Autocrit score is on target given stylistic preferences.) None of these — Autocrit, Grammarly, or Microsoft — compose, but they do impact the composition. Please don’t get me wrong. I love Autocrit, but like a powerful drug, it needs to be administered correctly. Also, as one of my writing professors used to say, “You gotta know the rules before you break them.” Run the first pages of best-selling novels through any of the above tools and alarms will go off, but you wouldn’t want to change any piece or part of the sentence structure. Individual grammar and editing applications are like singular tools. A hammer alone won’t build a house. Oops. Number 6 should read …after 4 & 5. Wow! Thank you for sharing your process with us. I know a lot of authors will get some ideas and insight from seeing how a fellow author approaches a comprehensive editing process. Another new writer here. I use grammar checkers but find them of limited use. Fiction in general and dialogue in particular seems to confuse grammar checkers. We have designed the backend tools and processes which power AutoCrit to be optimized for fiction, and we do believe that sets us apart in the marketplace and brings value for authors of fiction. A grammar checker is Highly recommended. As writers, we need all the help we can get to polish our works. Even if we are sending our manuscripts to human-proofreaders, the fewer mistakes the materials have, the more time the proofreaders have to identify and suggest fixes for other writing sins. I utilize the talents of real people for grammar checks along with Grammarly for quick checks. I think the computer programs are great during the writing phase when I am not sure how to structure something I’m writing, but it is really nice to commiserate with a live group instead of depending on the cold space of algorithms. There’s definitely always going to be a place for real, human editing. We hope that programs like AutoCrit can help authors send the most polished product on to their editors, thereby saving them time and money, as well as ultimately providing readers with a well-written, fantastic story.